Iowa Catholic Conference executive director Tom Chapman speaks at news conference as Senator Bolkcom & Representative Petersen prepare to address reporters. The Iowa Catholic Conference has joined with Democrats in the legislature to denounce the “payday” loan industry. The group is calling for a 36% limit on the interest rate which can be charged on so-called “payday” loans. At an estimated 250 locations in Iowa, clients of payday loan companies may write a personal check, put a future date on it, and receive a loan. Critics say the problem is people end up paying as much as 400 percent interest on these loans. A bill that would enact new restrictions on payday loans cleared the Iowa Senate Ways and Means Committee last year and is eligible for debate in the full Senate this year. Senator Joe Bolkcom, a Democrat from Iowa City, says the “loan shark rates” of payday loans need to be limited. According to Bolkcom, there were $1 million worth of payday loans issued last year in Iowa alone and most consumers who took out a payday loan would up with a dozen loans. Representative Janet Petersen, a Democrat from Des Moines who is chair of the House Commerce Committee, hopes to steer a bill through her committee which would place new restrictions on payday loans, but she’s not confident a majority of committee members would support limiting the interest rate on such loans. The Catholic Conference would still like to see the interest rate limited to 36 percent. “We’d prefer to see a cap,” Chapman says. The Iowa legislature recently limited the interest rates on car title loans to 36 percent. Jim Carney, an Iowa-based lobbyist for the payday loan industry, says that limit put the car title loan industry out of business in Iowa and a similar limit would ensure payday loan businesses would close as well. Carney says payday loan firms are not banks or savings and loans and their business model cannot be successful with a 36 percent limit on interest rates. Carney cites reports from the Iowa Superintendent of Banking which found fewer than 20 complaints were filed by customers of payday loan companies in Iowa over a six year period in which about $4.6 million in payday loan transactions were made in the state. “To me, that speaks volumes,” Carney says. Other groups are joining the Catholic Conference in calling for limits on payday loan interest rates. Iowa Citizens for Community Improvement will hold a meeting on Thursday evening in Des Moines to craft its lobbying effort on the issue. 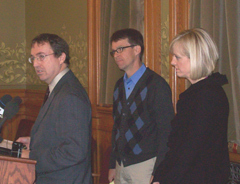 Click on the audio link below to listen to this morning’s statehouse news conference featuring Chapman, Bolkcom and Petersen.